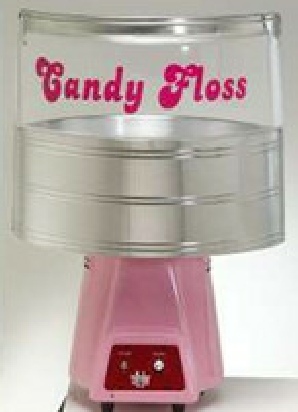 Candy Floss - An enchanting transformation from sugar to liquid and then into the cotton spun effect of Candy Floss. This fun food is a joy to watch being made and an easy learnt skill (after just a little practice + some trial and error). candy losses will be very quick. Have fun and involve you customers / clients /colleagues. 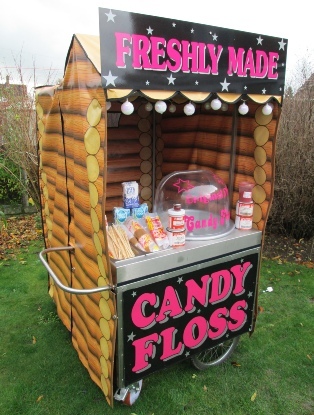 The lovely smell of the heated sugar is another bonus of hiring a candy floss machine This surely most be a fun trade stand attraction. 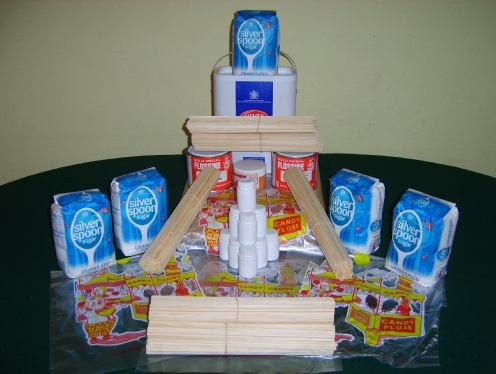 The machine has a spinning head, which holds the sugar reserve. The head is filled with granulated (coloured) sugar. This head also has the heaters that melt the sugar to liquid, which is then spun out through the tiny mesh holes by central fugal force. The molten sugar solidifies in the air instantly and is caught in the larger bowl which surrounds the spinning head. 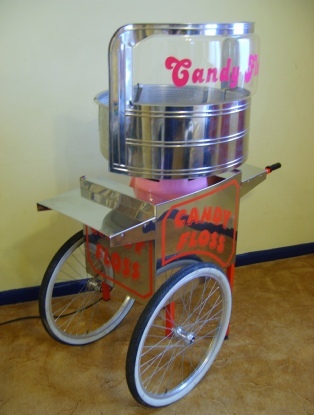 After a short period, the cotton candy floss builds up on the inside walls of the larger bowl, at this point the machine operator twirls a stick around the rim of the large catch bowl, gathering the sugar strands to make a candy floss which is normally served on a stick or in a plastic bag. As the sugar reserve bowl empties, the operator recharges the reserve bowl with more sugar. The product is sensitive to humidity and will slowly dissolve. A great exhibition stand marketing idea at a trade fair, trade show, conference meeting, Europe, international, expo. Alexandra Palace, Business Design Centre, Bournemouth International Centre, Donington Exhibition Centre Donington Park, Earls Court, Epsom Downs Racecourse, ExCeL, G-Mex Centre, Hilton Brighton Metropole Hotel, N.E.C, Kempton Park, Manchester Central Convention Complex, Novotel London West, National Exhibition Centre, Old Billingsgate, Olympia, Queen Elizabeth II Conference Centre, Ricoh Arena, The O2 Arena, The Royal Armouries Museum, Sandown Park Exhibition and Conference Centre, Stoneleigh Park, Telford International Centre, The Brighton Centre, Cardiff International Arena.